Leslee Cohen has been practicing law for decades in her hometown of Chicago. She’s been working with more and more startups over the last ten years, after co-founding her own firm (Herschman Cohen) and expanding along with the city’s tech scene. “I have one partner and we have now hired two other women to join us. We are extremely conscious of the fact that startups and small businesses have a lot of important uses for their dollars other than legal fees. We are all senior-level attorneys and we never double bill. What that means to our clients is that if one of us does the work and needs a second set of eyes in a particularly complex contract, those additional hours are not billed. Below, you’ll find the rest of the founder reviews, the full interview, and more details like their pricing and fee structures. 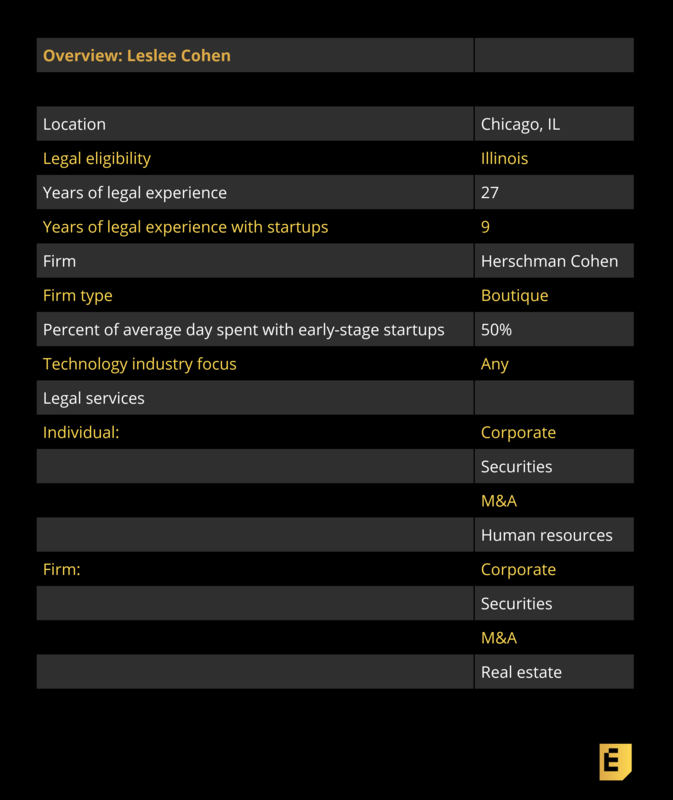 This article is part of our ongoing series covering the early-stage startup lawyers who founders love to work with, based on this survey (which we’re keeping open for more recommendations) and our own research. If you’re a founder trying to navigate the early-stage legal landmines, be sure to check out our growing set of in-depth articles, like this checklist of what you need to get done on the corporate side in your first years as a company. Eric Eldon: How does your practice work, given that you’ve struck out from a big law firm to cofound a boutique firm? What are you focused on with early-stage companies? Leslee Cohen: One is startup formation and I do work with those ‘I have an idea’ kind of companies. Usually I’ll talk for an hour for free to anybody who is at that point, but usually other than entity formation — which a paralegal can do — you probably should focus on developing your idea a little more before you spend money on a lawyer. Once someone is ready to actually start a company, I’ll do it all at that stage, even pre-funding, and help with entity selection and formation, organizational documents, bylaws and what-have-you. And then co-founder agreements, a lot of co-founder agreements. I think that’s really important, I understand if someone comes to me and says I’m starting a company with my sister or with my best friend from kindergarten that’s not your first thing you want to spend money on in terms of legal fees. But, with those few exceptions, I’ve seen so many co-founder breakups that it’s really important to me. The furthest I’ll go into real estate is the first lease. Eldon: How does this compare versus what you used to do in BigLaw? Cohen: I was in that world, so I understand what goes on — the fees, and really the pressure to bill hours — and that’s my number one pet peeve that we really focus on here. I have one partner and we have now hired two other women to join us. We are extremely conscious of the fact that startups and small businesses have a lot of important uses for their dollars other than legal fees. We are all senior-level attorneys and we never double bill. What that means to our clients is that if one of us does the work and needs a second set of eyes in a particularly complex contract, those additional hours are not billed.